In the first book to examine the industry of reproductive technology from the perspective of the consumer, Gay Becker scrutinizes the staggering array of medical options available to women and men with fertility problems and assesses the toll—both financial and emotional—that the quest for a biological child often exacts from would-be parents. Becker interviewed hundreds of people over a period of years; their stories are presented here in their own words. Absorbing, informative, and in many cases moving, these stories address deep-seated notions about gender, self-worth, and the cultural ideal of biological parenthood. Becker moves beyond people's personal experiences to examine contemporary meanings of technology and the role of consumption in modern life. What emerges is a clear view of technology as culture, with technology the template on which issues such as gender, nature, and the body are being rewritten and continuously altered. The Elusive Embryo chronicles the history and development of reproductive technology, and shows how global forces in consumer culture have contributed to the industry's growth. Becker examines how increasing use of reproductive technology has changed ideas about "natural" pregnancy and birth. 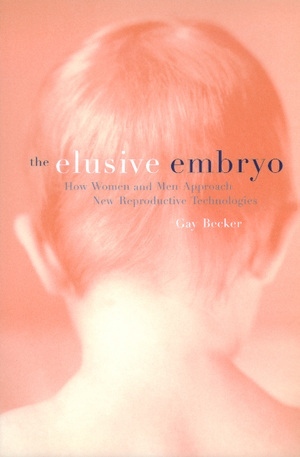 Discussing topics such as in vitro fertilization, how men and women "naturalize" the use of a donor, and what happens when new reproductive technologies don't work, Becker shows how the experience of infertility has become increasingly politicized as potential parents confront the powerful forces that shape this industry. The Elusive Embryo is accessible, well written, and well documented. It will be an invaluable resource for people using or considering new reproductive technologies as well as for social scientists and health professionals. Gay Becker is Professor of Medical Anthropology and Social and Behavioral Sciences and an investigator at the Institute for Health and Aging at the University of California, San Francisco. She is the author of Disrupted Lives: How People Create Meaning in a Chaotic World (California, 1997), Healing the Infertile Family: Strengthening Your Relationship in the Search for Parenthood (California, 1997), and Growing Old in Silence (California, 1980). "As a longtime facilitator of infertility support groups, I found The Elusive Embryo to be a fascinating and powerful examination of the cultural forces that shape the experience of being infertile as well as of the relationship between reproductive technologies and the consumers they serve. This is a book that makes you think; it is also one that offers recognition, perspective, and ultimately solace to those undergoing the transforming process of dealing with infertility. "—Cecile T. Lampton, M.S.